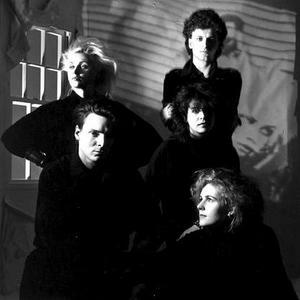 Xmal Deutschland was formed in 1980 by Anja Huwe (vocals), Manuela Rickers (guitar), Fiona Sangster (keyboards), Rita Simon (bass guitar) and Caro May (drums) in Hamburg, Germany. Their first single, "Gro?stadtindianer" was released a year later on Alfred Hilsberg's ZickZack label. The band also contributed the to the label compilation Lieber Zuviel Als Zuwenig (ZZ 45). Around this time Rita Simon was replaced by Wolfgang Ellerbrock. In 1982 the band released the Goth classic "Incubus Succubus". Drummer Caro May left the band and formed a new band, and the vacant drummer position was filled by Manuela Zwingmann the same year. While German audiences were less than receptive at first, a United Kingdom tour opening for the Cocteau Twins resulted in a label deal with independent label 4AD Records. Their debut album, Fetisch and the singles "Qual" and "Incubus Succubus II" were released in 1983, all 3 making the UK Independent charts, even though the band wrote and performed in German. Manuela Zwingmann left the band after one year, being replaced by Peter Bellendir. This lineup, Huwe/Rickers/Sangster/Ellerbrock/Bellendir proved to be the longest running. 1984 saw the release of the single "Reigen" and the album Tocsin, followed by a world tour through 1985. The Sequenz EP was essentially a remake of a John Peel session, which had been originally recorded April 30, 1985, and was broadcast May 13, 1985. The EP contained the tracks Jahr Um Jahr II, Autumn (the band's first English lyrics, apart from brief snatches of English that appeared in Qual, Young Man and Tag f?r Tag) and Polarlicht but omitted Der Wind, which was played at the Peel sessions. 1986 saw the release of Matador, produced by Hugh Cornwell of The Stranglers. Xmal Deutschland also opened for The Stranglers at a concert at Wembley Arena in London. Their follow-up album, Viva was recorded in Hamburg and was released in 1987, followed by the single "Sickle Moon". Viva contains a large number of English lyrics, among others a poem by Emily Dickinson. It was during this time that the band were interviewed by Jamie Meakes for the infamous underground Goth Fanzine 'House Of Dolls'. After the release of Viva, Manuela Rickers, Fiona Sangster and Peter Bellendir left the group. Anja Huwe and Wolfgang Ellerbrock continue to work with Frank Z. (Abw?rts) on guitar. Producer Henry Staroste played keyboards, and German studio drummer Curt Cress completed the line-up that would record the 1989 LP Devils and the singles "Dreamhouse" and "I'll be near you". This also proved to be the last release of Xmal Deutschland, showing a change of direction towards mainstream pop. 1990 saw a few scattered live appearances by the group, but eventually the group split up.